Today was Rememberance Day- a day where we gather and think about the soldiers that have died over the course of the years in order to defend our rights and freedoms. For many, it's a meaningful day, while for those of us that are either part of a military family (my own Dad and Brother were in the service), or are in the military (I served 16 years, myself), it can be a very personal day of remembering. I spent today with my Dad and my Brother. 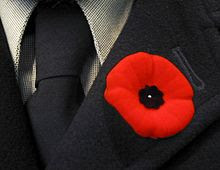 We watched the ceremonies and the parade before retiring to the Legion to reconnect with friends and comrades. Over hot rum toddies, we called forth memories of various training exercises, summer taskings, and random events that we've been through during the course of our military careers. We also looked around us at the new generation of soldiers, just starting out in the service. I found it hard to believe that I once was that young and baby faced. I also saw many of the Sergeants present were people I knew as Privates. In fact, I did most of their paperwork when I was in the service. I also keenly felt the presence of those that were absent, and the memories came flooding back. Standing on parade while they got their Regimental cap badge, or their promotions. Sitting in the Junior Ranks Club after a weekend exercise sharing a beer and joking about some of the silly things that happened that weekend. Going up to the Armoury for a beer and a game of "Axis & Allies", "Risk", or "Halo". I watched many of them grow as soldiers into fine adults and leaders. I watched as many of them went off on United Nations missions to Bosnia, or NATO missions to Afghanistan. I stood as some of them didn't come home. One young soldier comes to mind. She was an Infanteer- this was just as women were starting to make a proper impact on the Combat Arms in the military. She was tasked to help me set up the modular tentage for one of our Brigade exercises in Fort Lewis. I was standing on a wooden six foot table screwing in lightbulbs as she handed them up to me. We talked about some of the reasons why I was still a Corporal at the time, what we both hoped to accomplish, etc. At this time, I discovered that she didn't know if she could honestly make an impact as an Infanteer, and was thinking of moving on to another trade. She was taking Engineering at university at the time, so we started discussing the possibility of her remustering over to Engineer. I described to her what Field Engineers, Construction Engineers, and Electrical Mechanical Engineers did, and that I felt that Field Engineering would probably suit her best. Ultimately, she did decide to remuster, and taking the advice I'd given her, she went Regular Force as a Field Engineer. The military helped pay for her to complete her university education, and she took her commission and became an Officer. A couple of years later, during a training exercise, she was killed when the explosives her team and her were laying went off. I remember the numbness I felt when I heard the news. I simply had a hard time believing it. I still have a hard time believing it- and it's been at least a decade or so since the accident occured. So, when Rememberance Day comes around, and I look at the fresh faced soldiers around me, I remember her, because she thought that freedom and equality was worth the risks involved in her job.